"This unusual sounding soup is delicious. 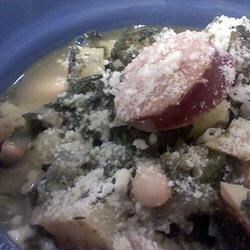 Even if you are not crazy about collards, you'll enjoy this, my family loves it!" Place water and kielbasa into a soup pot, cover, and bring to a boil over high heat. Reduce heat to low, and simmer for 30 minutes. Stir in diced potatoes, and simmer 15 to 20 minutes more. Add greens and beans, simmer for 20 minutes longer. While the greens and beans are cooking, place a saute pan over medium heat. Stir in the bacon, and cook to melt out some of the fat. Sir in the garlic, onions, and bell pepper; cook until the bacon is almost crisp. Drain off as much grease as you can, and add the mixture to the simmering soup, and cook an additional 15 to 20 minutes. Season to taste with salt and pepper. This soup, cut in half, is also well suited to the slow cooker. Just cook the bacon, garlic, onion, and bell pepper as above, then add it to the slow cooker with all of the other ingredients except for the salt and pepper. Cook on Low for 4 to 5 hours, or High for 2 1/2 hours. Season to taste and serve. Easy! would hsve been better without the potatoes and bacon. Cooked this soup just as the recipe states and it was great!! I'm even from the South and it passed our Southern taste buds.